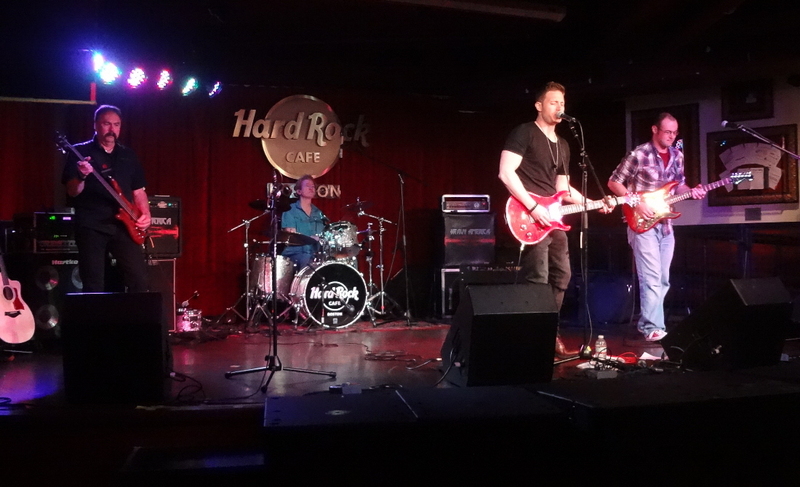 There were five bands on the Friday night bill at the Hard Rock Cafe – The Holographics, Heavy America, Chris Moreno, Miele, and The Cosmonautz. I had to leave around 11:00, so I only caught the first three. Of course, I was there specifically to see Chris Moreno, whose album I reviewed a few months ago. This was the first time I had made it to one of his live gigs. The evening was kicked off by The Holographics, a young band from Providence. 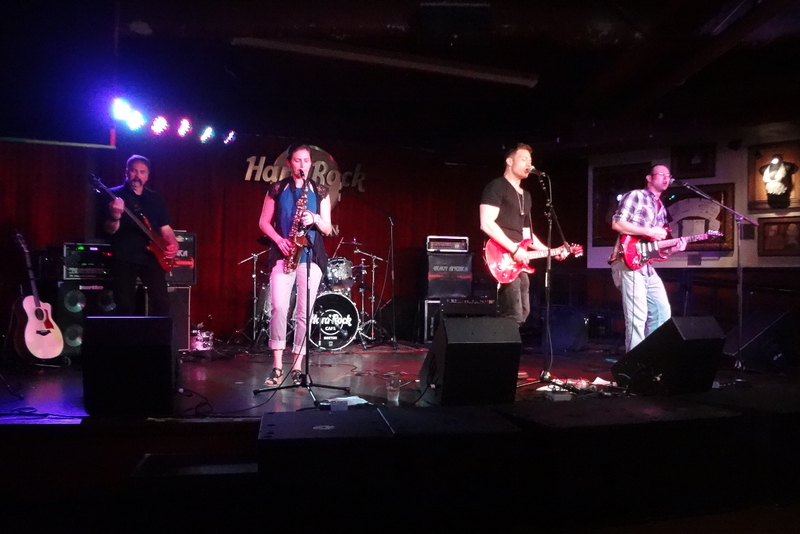 The band began its set with a style best described as alt-rock with a spacey synth line. Musically, the band’s alt-rock vocals were often buried in a wall of sound. The vocals were consistently no more prominent than any instrument, clearly by design, providing The Holographics’ signature sound. The band’s current single, “An Hour Ahead,” was a little more jangly with lighter instrumentation – a fun song and a good choice for a single. Other influences emerged as the set progressed. One song in particular showed the group’s ability to drive a song with a blues groove. The back half of set was decidedly more guitar-heavy than the first – wall of sound yielding to wall of axe – though you could still hear the synth in mix, of course. One song, “In My Head” (maybe; I didn’t get the official song titles) sported a bit of funky rhythm and both classic and alt rock guitar riffs for the band’s most lively, energetic turn of the night. 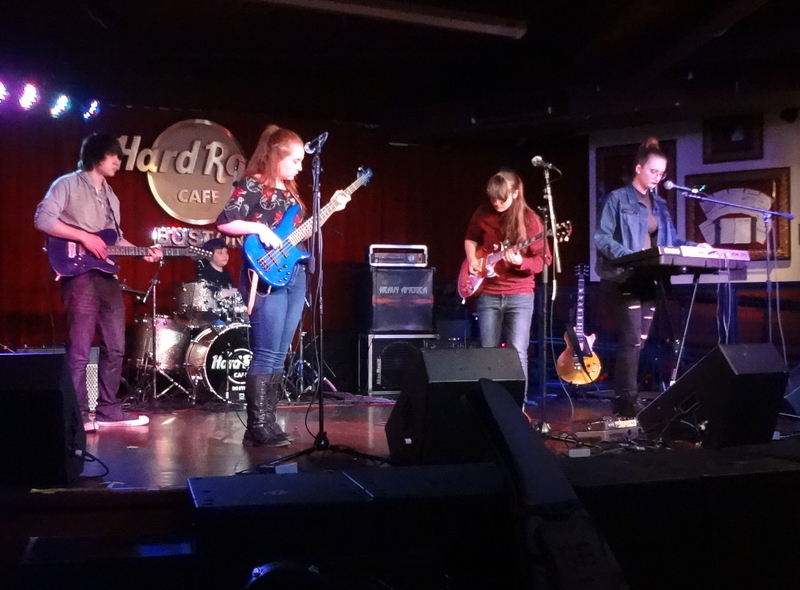 The Holographics closed with a song with easier-to-spot spacey synth work again, almost as if tying the end of the set to the beginning, though there was still plenty of both classic and alt rock guitar – they seem to enjoy mixing those guitar sounds within a song. The last song was also a bit on the progressive end of the band’s musical scale, almost “Aqualung”-ish in style. A talented young band, The Holographics provided an enjoyable first set. Heavy America seriously cranked up the volume with its set. Also “wall of axe,” but Heavy America’s were louder, more aggressive axes. This was the album release show for the band’s new disc Now, which has been out for about a month, so the band opted to play its entire new album as its performance on this night; it’s cool when bands do that for album release shows. Heavy America’s music is rooted in straight-ahead, blues-based classic rock, but this power trio mixes in some tempo-changing finesse and seemingly a little funk to spice up the heavy guitar foundation. This is an aspect of its musical stew Heavy America shares with fellow Bostonians Aerosmith and Extreme. But Heavy America is clearly heavier, more musically caustic, adding a harsher element to its rock mix, whether from punk, alt-rock, or the rawer corners of metal; likely a mix of all of the above. Throughout the set (and, obviously, the album), the band varied its songs within its core musical style, which was fully embodied by its first single from Now, “Pray For Me” – straight-ahead hard rock with nary a glimmer of light but still with some finesse. With variations on that theme, that does seem to be their style. Some of the songs drifted a bit into a more old-school classic rock direction that I couldn’t really verbalize until was struck by it in the second-to-last song of the set, “Heavy Eyes.” Pink Floyd. I swear I hear a bit of Dark Side of the Moon-era Pink Floyd, most prominently in heavy eyes. Or at least something resembling it. 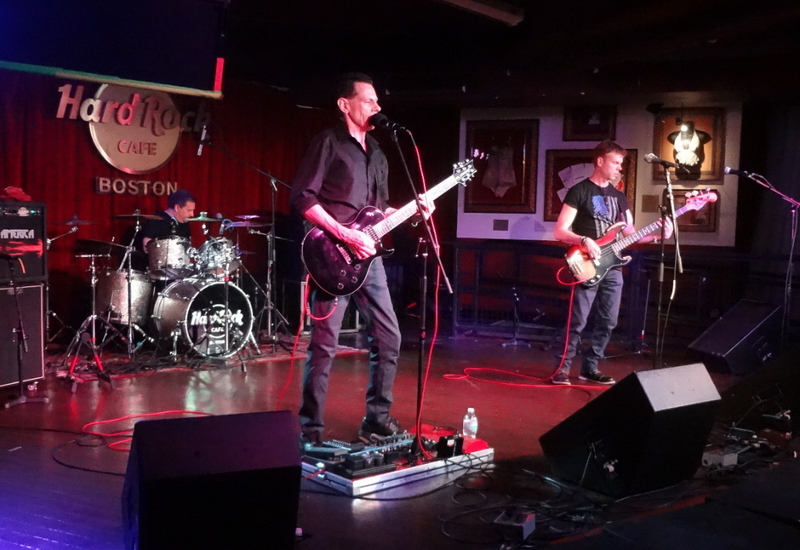 In the end, Heavy America delivered an energy-filled set of consistently loud and frequently edgy rock and roll well-suited to entertaining a club full of hard rock fans across multiple sub-genres. I specifically targeted a “full band” show on Chris’ calendar rather than an acoustic one because I wanted to hear his songs in all their electric glory, though he performs the sort of song-driven rock music that would translate readily to an acoustic setting, so I really couldn’t go wrong. On this night, Chris was joined onstage by bandmates Eric Garibaldi (guitar), Rod McCarthy (drums), Dave Brideau (bass), and, for three songs, saxophonist Hannah Moverman. 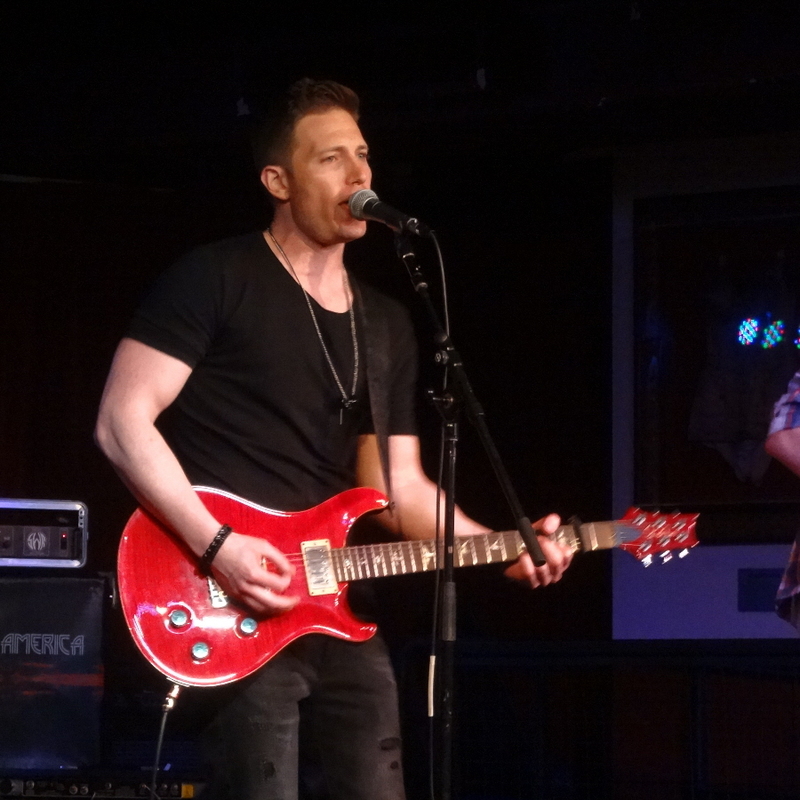 Stylistically, Chris’ music is very similar to Matchbox 20, with elements of other bands in that catchy pop-rock neighborhood, rooted in song-driven rock and roll with a classic rock core, catchy hooks, and tunefully straining, emotional vocals. Most of the songs Chris performed tonight were from his Into the Sun album. He kicked things off with one of my favorites from that disc, “All I Need.” It mixes a driving rhythm, catchy hook, and that little bit of emotional grit in the vocal that can make a song irresistible. Chris followed that up with a heavier rockin’ edge on “Don’t Let Me Down,” before the band was joined onstage by Hannah for three songs, beginning with “Turn the Page,” again sporting Chris’ trademark hit radio-ready sound driven by hooks and emotional vocals. This song, in particular, reminds me of an old New Jersey band I loved back in the ’90s, Outcry, whose melodic college rock was one minor stroke of luck away from national recognition. Next up was “Reach for Me,” a song that softened the energy a bit thanks to Chris’ switch to acoustic guitar for this number. This is the song from Into the Sun that is most imbued with a Counting Crows vibe. And the sax, here in particular, added an extra coolness to this song. It’s a wonder more rock bands don’t perform with a saxophonist on stage; it adds a depth to some song segments and punctuates others. After that, Chris slowed things down a little with the more melancholy-sounding “Try,” which was followed by a very cool cover of Tracy Chapman’s “Fast Car,” faster-paced that the original and with a smoother vocal. It’s smoother by comparison, anyway, as Chris’ voice usually embraces that hint of strained gravel, but “Fast Car” even had moments that showcased his vocal ability to hit some big, clean notes, something he doesn’t do particularly often. Next up was a new song, “That Song,” a trademark Chris Moreno tune that creatively departed from the norm a bit in spots, with some interesting rhythms and guitar riffs adding a welcome, unique, different texture. Next-to-last was another personal favorite, “Finally Free,” as I particularly enjoy the way the song seems to coil and release. Late in the song, Eric Garibaldi delivered a stellar guitar solo to move the song along toward its end. This one’s also extra-cool because of the way Chris’ vocal moves around the melody a bit more than usual. The band closed the night with “Closer To You,” a catchy crowd favorite, featuring a little extra texture in Chris’ vocal and more frantic strumming at the end. Great way to end the set. Indeed, I wasn’t surprised by the caliber of Chris Moreno’s (and his band’s) performance. I had heard and loved the album, so I knew what to expect, and I wasn’t disappointed. I look forward to catching another of his gigs when I get a chance, and I’d urge you to, as well. 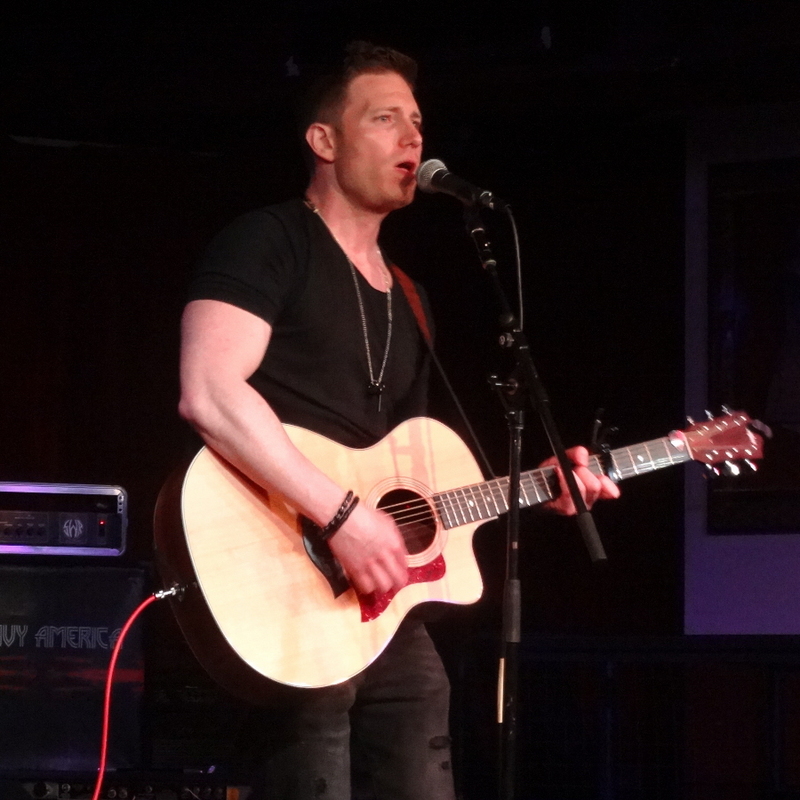 This dude writes catchy songs every bit as good – and just as catchy – as the best of mainstream pop-rock radio, and he surrounds himself with talented musicians. The events page on The Holographics’ Facebook page shows a June 26th gig at Dusk in Providence, RI. The gigs page on Heavy America’s website lists a show tonight, June 10, at the Carousel Lounge in Salisbury, MA. And the shows page on Chris Moreno’s website is currently empty, but check back for shows to be added. This entry was posted in Live Reviews and tagged Chris Moreno, Geoff Wilbur, Geoff's Night Out, Heavy America, Live Review, The Holographics. Bookmark the permalink.